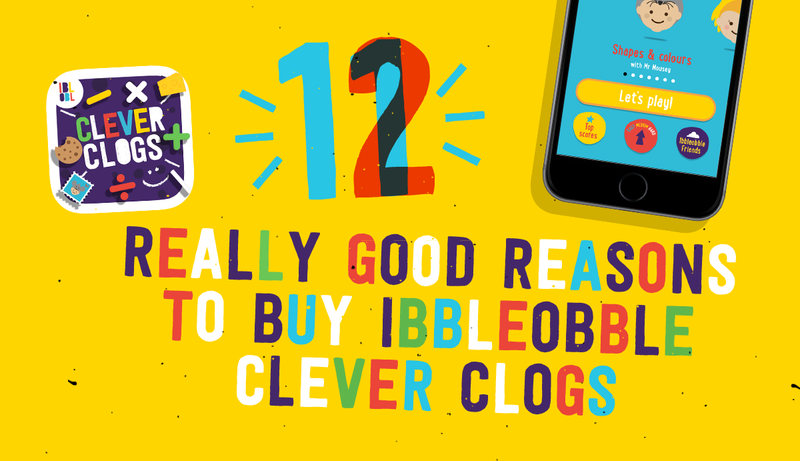 In this post we explore 11 12 really good reasons why buying Ibbleobble Clever clogs – an educational App bundle for kids – will not only benefit your child, but will save you some money too! Here at Ibbleobble, we understand there is an abundance of choice out there when searching for an ideal solution for your child’s educational needs. Whether it’s a building block set from The Early Learning Center, a maths puzzle book or an App from the App Store, making the right choice can sometimes be confusing, time-consuming and often problematic. Since this educational app bundle is made up of seven individual apps, this means there are over 1000 of different puzzles included. Addition with Ibbleobble will help your child looking to improve their addition skills, Words with Ibbleobble will help you child familiarise themselves with new vocabulary and for the intermediate learner, Multiplication with Ibbleobble will help your child to practice their times tables. The sheer variety included in this bundle also means that your child can pick and choose what they can learn at their leisure. In terms of game play, all of our apps have puzzles that require answers from a multiple list. We can’t stress how important it is for children to feel comfortable with simply ‘having a go’ – This in turn builds confidence that if getting an answer incorrect, doesn’t necessarily mean they have failed, they can choose another answer and over time the learning process will gradually sink in. Ever practiced for your driving test? or used the term ‘practice makes perfect’? Well here at Ibbleobble this theory cannot be any truer. In the case of practicing the same manoeuvres on your driving lessons – 25 lessons later, you actually find that you have learnt how to drive. Practice with Ibbleobble and you will fill comfortable round numbers. Not only does this bundle includes seven premium apps to support learning, each app is made up of seven levels of difficulty – in the case of the maths apps such as Division with Ibbleobble, the higher the level, the more challenging the sum. We are confident that youngsters learning with our apps will use these levels to assist their progress. One of the most frequent nuggets of feedback we get from parents and industry experts is how simple and easy-to-understand the game play is. We have often used games that you have no idea what’s going on. The games seem to be over complicated and impossible to digest. We have gone to great lengths to make sure that ‘simplicity is king’ and that it’s children using the app. While we have made extra effort to make sure the game play is idea for pre-school children and beginners, we have included some original sound bites and complementary sounds to enhance the experience. Some of the sounds bites are actually recordings of our niece Lola (the chicken) – and not stock sounds. So one could say we are making it a truly educational experience for some of the people involved! We are proud to have come up with Ibbleobble and all our graphics are originally produced – we often see solutions out there that rely heavily on stock graphics. We hope by providing something that is a truly original product, produced by independent developers it will offer something unique in the marketplace. One review of our app Sequences with Ibbleobble described our graphics as ‘gorgeous’ – A complement certainly to be proud of! We totally understand the importance of steering away from any form of advertising in any our apps. Of course, it would be a nice little ‘money spinner’ for us, but we respect these apps are for children and therefore the removal of annoying ads are what make our apps a charming proposition. Some might argue that “We only buy free apps” or “Why should we buy an app?” but chances are there will be catch or a compromise. Many apps out there rely on advertising as an income that goes back to the original point. We believe in a “buy once” policy with no added catches of advertising or ‘in-app purchases’. While we have put our case forward to buy Ibbleobble Clever clogs, not only does it include 1000s of puzzles, fantastic colours and game play… or even the fact that all of our apps are Ad-free. But by buying Ibbleobble Clever clogs, you actually saving money. The seven app bundle effectively includes TWO apps that are actually free saving you parents nearly £4. This means more money to spend on ice cream… You can’t say fairer than that can you? What? there’s a twelfth reason why to buy Ibbleobble Clever clogs. This app bundle includes two award-winning apps. Patterns with Ibbleobble won Best Application 2016 at the Creativepool annual awards. Additionally Words with Ibbleobble received a ‘highly commended status’ at Lincs Digital awards. Ibbleobble recently received another award – this time Ibbleobble.com was crowned Creativepool’s ‘Best Website 2017’. We may only be small but we must be doing something right. If you wish to learn even more about Ibbleobble Clever clogs, you can find more information here. Or you can download Ibbleobble Clever clogs here.